I'm a cheese farmer in Providence, Ohio, but in my former life--details to be withheld at this particular time for security reasons--I was a chef. My specialty: Italian cuisine, though I'm not Italian. I adore the savory blend of spices. I love cooking and dining and spoiling the love of my life, Charlotte Bessette. I don't always put together elaborate spreads. At times, I enjoy a good picnic. My spur-of-the-moment picnics seem to thrill Charlotte. Though she's a great cook and Fromagerie Bessette, which she runs with her cousin, serves quiche and sandwiches in addition to the most phenomenal cheeses (including some double-creams from my Pace Hill Farm, if I might be so bold to include them among phenomenal), Charlotte loves a surprise. She's naturally spontaneous, which at times can get her in hot water, especially if she's, um, spontaneously investigating a murder...(that's another story for another day). But Charlotte appreciates when I stop into the store and whisk her off to a tasty, romantic meal. One time, I brought her a picnic brunch with pancakes and warm syrup. Let’s just say the hothouse behind The Cheese Shop where we ate the meal got a little steamy. Another time, I showed up with a lasagna complete with homemade sourdough bread, wine, and candles. Right now, I'm putting together a picnic that we’ll take to the premier of Hamlet, the open-air play the local theater is putting on in the Village Green. For milady, I’ve included one of my cheeses, raw vegetables and an herb dip. I purchased a pot pie from the Country Kitchen diner, and for dessert, caramel goat cheese cookies from the Providence Patisserie. Add a nice bottle of wine, and all in all, I think Charlotte will be pleased. So, what do you like to take on a picnic? Do you like a little romance mixed in? 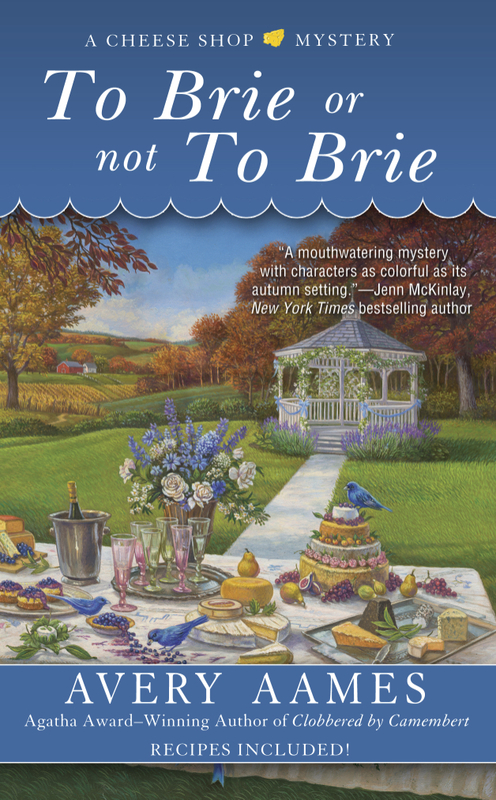 The first in the nationally bestselling A Cheese Shop Mystery series won the Agatha Award for best first novel. You can learn more about Avery Aames by clicking this link or on Facebook and Twitter. And if you haven't done so, sign up for Avery's mailing list so you can learn about upcoming events, releases, and contests! My daughter has played club softball for years and we have had lots of picnics out of our cooler on hot summer days. Pasta salads were her favorite and some kind of a homebaked treat was always appreciated. I like the usual, fried chicken, potato salad, macaroni salad and an assortment of fruits and vegetables. I like to take chicken, salad, French bread and a cute guy. Susie, I truly enjoy a pasta salad with all the goodies added in. Celery, diced hardboiled eggs, relish. Dru & Jaymie & Ingeborg, I have to agree that there's nothing that beats good fried chicken. It's got to be crisp and kept warm, don't you think? We would usually pack sandwiches & fruit & something YUM for afters. Since we have always lived on the beach, our picnics are normally the usual beach fare, fried chicken, homemade potato salad, fruit and lemonade or iced tea + my Moms famous chocolate chip chookies. I've never been on a real picnic in my life! But I would take things that you can eat easily, like little sandwiches, and pieces of cheese and toast, some fruit perhaps, and lemonade.